Battling the CURSE OF THE SPHINX–Review and Giveaway! Hi there! I’m happy to share a review for a new YA romance adventure from Raye Wagner. 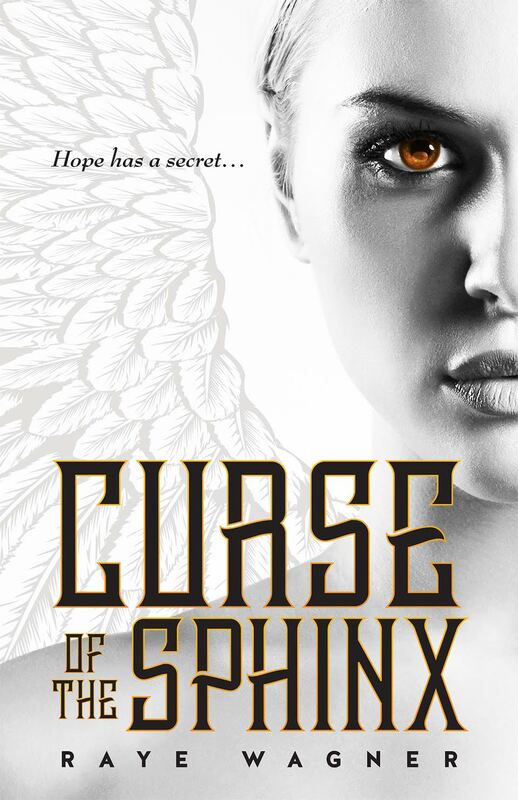 CURSE OF THE SPHINX is a contemporary imagining of a world where Greek Gods still rule, immortal demigods and monsters walk among mortals, and murderous Skia keep the balance. It was rather inventive and thoroughly engaging. Check out my review below, and be sure to enter the giveaway for a $50 Amazon gift card. When her mother is brutally ripped away from her, Hope’s life shatters. Is this the fulfillment of Apollo’s curse, murder from the shadow monsters of the Underworld? Or, have the demigods finally found her? Orphaned and alone, Hope flees again, but this time there’s no one to teach her who to trust—or how to love. This is a fun YA spin on contemporary mythology. The gods of Greece still rule from afar and their sired children, demigods, walk amongst the mortals. They are not many in number, and are often collected into conservatories in order to keep them safe from Skia, the spawn of Hades who hunt them and bring them to the Underworld. All of society understands that gods exist, or did, and kids learn Mythology as a regular subject in school. Much like the demigods of yore, monsters of myth live, too. Hope is trapped in a curse that spans thousands of years. Her grandmother was the famed Sphinx at Thebes, and each female offspring is immortal, a monster and untouchable by any other than Apollo or his sons. Hope’s mother fell for a mortal and sealed the curse of Apollo–and was punished for it. Orphaned and alone at age 16, Hope must find a way to survive her curse, and also society. She moves to a small town in eastern Washington and endeavors to get past her grief. It’s not easy. She has plenty of money, thanks to her grandmother’s golden treasure, but she’s never been on her own. She knows she should keep moving, running from the Skia that she sees with more and more regularity, but she has managed to make friends for the first time in her life. Plus, being a vagabond brings another element of vulnerability that Hope cannot truly contend with. Athan, a new student in school seems to charm everyone–except Hope. She’s upset with the world, though, and his sympathy eventually allows him access to her isolated realm. Expect the usual high school cattiness. I liked how Hope stood up for herself, and attempted to right wrongs. Her grief was deep, and her world so sheltered. She’s not sure what to do with the growing feelings she has for Athan, but she’s not willing to tell him her true secret. When she learns he’s a demigod her brief respite must end. She’s got to get on the road. Now. Or, so she thinks. I really liked all the supernatural elements of this one. The prose is a mostly effortless read with plenty of tension scattered throughout. Athan’s a swaggering boy, but he drops that act once he gets to know Hope. He could never have guessed her true nature, but he handles the big secret very, very well. It’s not ideal for him to love Hope, mostly because his father, Hermes, has some big plans to use Hope as a frustration to Apollo. That said, Athan acts honorably. This is a bit of YA romance, but it’s completely clean and age-appropriate. Well, if you don’t count the violence. For some reason violence is far more acceptable behavior for teens than sexytimes, but I digress. All-in-all, the plot is interesting, Hope’s big secret is different from one I’ve read before, and the book ends with new trouble on the horizon. So expect a MILD cliffhanger because the next book seems to be a completely new adventure for Hope. Not a problem for me, as this is a series I’d gladly dive into. Interested? You can find CURSE OF THE SPHINX on Goodreads and Amazon. Click on this Rafflecopter giveaway link for your chance to win a $50 Amazon gift card. Raye Wagner grew up in Seattle, the second of eight children, and learned to escape chaos through the pages of fiction. As a youth, she read the likes of David Eddings, Leon Uris, and Jane Austen. Inspired by a fictional character, Raye pursued a career in nursing, thinking to help the world one patient at a time. One summer afternoon, when her then young children were playing in the pool, a plot dropped into her head, and she started writing. She enjoys baking, puzzles, Tae Kwon Do, and the sound of waves lapping at the sand. She lives with her husband and three children in Middle Tennessee. Origin of the Sphinx, a novella detailing the story leading up to the creation of the mythological creature, is her first publication. It is the beginning of the Sphinx series. You can catch up to Raye online on her website, Twitter, Facebook, and Goodreads.